Sotho men in small village in Lesotho, Africa. UNDER A CLOUDLESS sky in South Africa’s northwestern farming region, donkeys still amble along muddy paths, pausing to nibble on grass, oblivious to the threat from a demand for Chinese medicine. The gelatin found in the animals’ skin has made them a target, leading to a growing wave of donkey slaughtering in several African countries, as gangs seek to fuel a lucrative, and in South Africa illegal, trade. Animal rights groups say the docile beasts of burden are often cruelly bludgeoned to death before being skinned in backyards and clandestine slaughterhouses. Around Mogosani village, in South Africa’s North West province, residents say syndicates catch the animals in grazing fields and pens. Soon after, skinned carcasses with hooves chopped off are found nearby. “The thieves are after the skins,” donkey keeper George Sising told AFP. Like many of the village’s poor and unemployed, Sising, 65, relies on the animals to make a living, using a donkey-drawn cart to collect recycling material, firewood and sand for sale. The donkey-hide gelatin has no commercial value in Africa but is highly sought after in China as an ingredient for traditional medicine to treat health problems such as anaemia and menopause-linked ailments. Hooves also contain gelatin, while the meat, consumed in parts of China, is believed to be more nutritious than beef and is enjoyed in burgers or stewed. “Many people here don’t eat donkey meat, they are just our animals,” said Sising. The gelatin, known in China as ejiao, is dissolved into hot beverages, or mixed with nuts and seeds as a snack. The industry is said to be worth millions of dollars and China is increasingly looking to Africa to satisfy demand after its own donkey population dropped sharply. Donkey numbers in China have nearly halved from 11 million in the 1990s to six million in 2013, according to the country’s national animal husbandry yearbook. “Jobs are scarce here, and donkeys are our source of income, if you own donkeys you can work for yourself,” said Ikgopeleng Tsietsoane, 25, another Mogosani donkey owner. In October, six of his nine animals were stolen and the perpetrators never found. “The theft is taking away our livelihood. If nothing is done, this village will soon have no donkeys left,” he said, adding his family had begun keeping the animals in 1991. He said the long-eared creatures were normally bought or sold for 400 rand (€29), but the price had surged to up to 2,000 rand. Tsietsoane was adamant that he would never let go of his remaining three animals. Two months ago, police in Johannesburg uncovered a storage container with more than 5,000 donkey hides, in what was described as the biggest bust so far. The collection is believed to have come from across the country and police have made several large finds in the city this year, suggesting a growing trend. “In one instance, donkey skins were found inside the yard of a tavern owned by a Chinese man,” said North West province police spokesman Sabata Mokgwabone. After the police busts prompted a public outcry, the Chinese embassy in January issued a statement insisting no formal trade existed with South Africa. “There is no Chinese company importing donkey skins from South Africa through legal channel(s),” it stated. But plans revealed in September to formalise the trade between North West province – believed to have the country’s biggest donkey population – and China’s Henan region may change that. Donkey prices shot up after the announcement. “The aim was to create commercial opportunities for people in rural areas who own these animals,” said Patrick Leteane, director general at the North West provincial government’s agriculture department. “We wanted to unlock a whole value chain that would involve breeding, feedlots, slaughtering and export,” he said. China produces 5,000 tons of ejiao each year, requiring some four million hides, according to the China Daily. 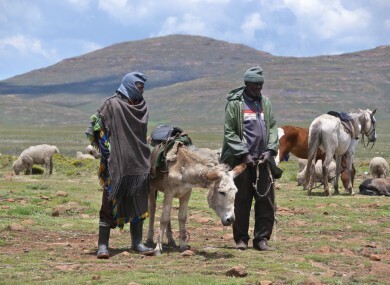 Speaking to AFP, Kabelo Nkoane, of the Highveld Horsecare Unit, said the animal welfare group’s staff began noticing donkey killings two years ago and now discover piles of donkey hides and meat in backyard slaughterhouses at least four times a week. “The animals are killed in a very cruel manner, bludgeoned in the head with a hammer or stabbed,” said Nkoane. “They are then skinned and, according to our sources, their skins taken to China, where they harvest the gelatin used in medicines. South Africa’s landlocked neighbour, Botswana, currently legally exports donkey meat to China, as does Kenya, and Namibia is in the process of setting up an abattoir to service the Chinese market. But formalising the trade has not stopped illegal, cruel killings. After facing an unsustainable donkey slaughter, Burkina Faso last year announced a ban on the export of donkey meat and skins to Asia. Email “China's demand for medicine fuels African donkey slaughter”. Feedback on “China's demand for medicine fuels African donkey slaughter”.